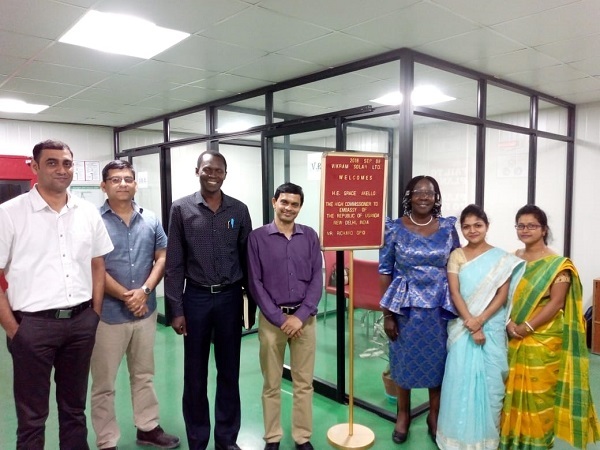 The Pro-Vice Chancellor of Jadavpur University of Kolkata, Professor Pradip Kumar Ghosh, has welcomed collaboration between his University and universities of science and technology in Uganda. He elaborated that his university is home to many areas of engineering as well as other sciences and some arts disciplines. Highly rated throughout India and Asia, Jadavpur university boasts of graduate and post-graduate students from all over the world. The meeting with the Pro-Vice Chancellor was one of the many which the High Commissioner of Uganda to India held during a five-day working visit to the eastern state of West Bengal from 5th to 10th September. Apart from the meetings, she also visited one of the country's solar panel manufacturing plants at Falta Special Economic Zone set up by the Government of India in 1984. In this zone consisting of many other industries is to be found Vikramsolar, a solar panel manufacturing plant. Vickram manufactures 5,000 solar panels per day in a hi-tech automated manner but with some functions needing the delicate touch of highly trained engineers and technical workers. After touring the plant, the High Commissioner held meetings with the management team led by the General Manager Mr Dinesh Saini. The hi-tech plant has won contracts to light Koci airport in India which now is 100% run by renewable energy. It has also installed power plants at Kolkata airport among others. Vikram management expressed interest in Uganda's power sector; offering to install solar plants to run institutions such as Entebbe International Airport, among others. Back in Kolkata, the High Commissioner held consultations with many other business agencies. At a meeting organized by Ms Anuradha Chakrabarti of the West Bengal branch of the Confederation of Indian Industry, the High Commissioner and Mr Richard Opio, Secretary handling Commercial Diplomacy at the High Commission, held discussions with prospective investors in the areas of infrastructure, tourism and transport. A West Bengal business delegation is scheduled to visit Uganda in late October, 2018. A meeting with the tea business community of East India revolved around issues of branding and marketing of Ugandan teas. The Team benefited from advice on global marketing prospects for Ugandan teas by Ulpi Gupta, a renowned tea-taster, and that of Joydeep Phulkan of the India Tea Research Association. The latter agreed to organize a tea-researchers' visit to Uganda which is to be organized by the High Commission. Among other meetings held by the High Commission during this visit was one with the MSME Tool Room, Kolkata. In discussions with its General Manager, Debdutta Guha, the Team was happy to learn that the Centre was ready to share with Uganda its highly successful model of training and tooling young business entrepreneurs. Mr Guha explained that the Tool Room was a dimension of the MSME approach to industrialization. Started soon after independence as part of India's self-reliance policy, the MSME tool room concept has caught on in India and is today one of the most critical elements of the country's manufacturing sector. There are three aspects to the model namely: training of trainers of young people, training of eligible young people themselves and the tooling and placement of successful graduates. As a result of India's concerted effort over the years, the MSME sector is today a critical factor in the country's manufacturing sector mix.